The Mental Capacity Act 2005 provides a statutory framework to empower and protect vulnerable people who are not able to make their own decisions. It makes it clear who can take decisions, in which situations, and how they should go about this. It enables people to plan ahead for a time when they may lose capacity. Guidance on the Act will be provided in a Code of Practice. People who are placed under a duty to have regard to the Code include those working in a professional capacity e.g. doctors and social workers. A draft was made available to assist Parliamentary consideration of the Bill and is available on the DCA website (under “Mental Capacity Bill and supporting documents”). Least restrictive intervention – anything done for or on behalf of people without capacity should be the least restrictive of their basic rights and freedoms. The Act enshrines in statute current best practice and common law principles concerning people who lack mental capacity and those who take decisions on their behalf. It replaces current statutory schemes for enduring powers of attorney and Court of Protection receivers with reformed and updated schemes. Assessing lack of capacity – The Act sets out a single clear test for assessing whether a person lacks capacity to take a particular decision at a particular time. It is a “decision-specific” test. No one can be labelled ‘incapable’ as a result of a particular medical condition or diagnosis. Section 2 of the Act makes it clear that a lack of capacity cannot be established merely by reference to a person’s age, appearance, or any condition or aspect of a person’s behaviour which might lead others to make unjustified assumptions about capacity. Best Interests – Everything that is done for or on behalf of a person who lacks capacity must be in that person’s best interests. The Act provides a checklist of factors that decision-makers must work through in deciding what is in a person’s best interests. A person can put his/her wishes and feelings into a written statement if they so wish, which the person making the determination must consider. Also, carers and family members gain a right to be consulted. Acts in connection with care or treatment – Section 5 clarifies that, where a person is providing care or treatment for someone who lacks capacity, then the person can provide the care without incurring legal liability. The key will be proper assessment of capacity and best interests. This will cover actions that would otherwise result in a civil wrong or crime if someone has to interfere with the person’s body or property in the ordinary course of caring. For example, by giving an injection or by using the person’s money to buy items for them. Restraint/deprivation of liberty. Section 6 of the Act defines restraint as the use or threat of force where an incapacitated person resists, and any restriction of liberty or movement whether or not the person resists. Restraint is only permitted if the person using it reasonably believes it is necessary to prevent harm to the incapacitated person, and if the restraint used is proportionate to the likelihood and seriousness of the harm. Section 6(5) makes it clear that an act depriving a person of his or her liberty within the meaning of Article 5(1) of the European Convention on Human Rights cannot be an act to which section 5 provides any protection. The Department of Health and National Assembly for Wales have each issued interim advice to the NHS and local authorities on the implications of the European Court of Human Rights judgment in HL v United Kingdom (the “Bournewood” case), pending the development of proposals for new procedural safeguards for the protection of those people falling within the “Bournewood gap”. Lasting powers of attorney (LPAs) – The Act allows a person to appoint an attorney to act on their behalf if they should lose capacity in the future. This is like the current Enduring Power of Attorney (EPA), but the Act also allows people to let an attorney make health and welfare decisions. Court appointed deputies – The Act provides for a system of court appointed deputies to replace the current system of receivership in the Court of Protection. Deputies will be able to take decisions on welfare, healthcare and financial matters as authorised by the Court but will not be able to refuse consent to life-sustaining treatment. They will only be appointed if the Court cannot make a one-off decision to resolve the issues. A new Court of Protection – The new Court will have jurisdiction relating to the whole Act and will be the final arbiter for capacity matters. It will have its own procedures and nominated judges. A new Public Guardian – The Public Guardian and his/her staff will be the registering authority for LPAs and deputies. They will supervise deputies appointed by the Court and provide information to help the Court make decisions. They will also work together with other agencies, such as the police and social services, to respond to any concerns raised about the way in which an attorney or deputy is operating. A Public Guardian Board will be appointed to scrutinise and review the way in which the Public Guardian discharges his/her functions. The Public Guardian will be required to produce an Annual Report about the discharge of his/her functions. Independent Mental Capacity Advocate (IMCA) An IMCA is someone appointed to support a person who lacks capacity but has no one to speak for them. The IMCA makes representations about the person’s wishes, feelings, beliefs and values, at the same time as bringing to the attention of the decision-maker all factors that are relevant to the decision. The IMCA can challenge the decision-maker on behalf of the person lacking capacity if necessary. Advance decisions to refuse treatment – Statutory rules with clear safeguards confirm that people may make a decision in advance to refuse treatment if they should lose capacity in the future. It is made clear in the Act that an advance decision will have no application to any treatment which a doctor considers necessary to sustain life unless strict formalities have been complied with. These formalities are that the decision must be in writing, signed and witnessed. In addition, there must be an express statement that the decision stands “even if life is at risk”. A criminal offence – The Bill introduces a new criminal offence of ill treatment or neglect of a person who lacks capacity. A person found guilty of such an offence may be liable to imprisonment for a term of up to five years. Research involving, or in relation to, a person lacking capacity may be lawfully carried out if an “appropriate body” (normally a Research Ethics Committee) agrees that the research is safe, relates to the person’s condition and cannot be done as effectively using people who have mental capacity. The research must produce a benefit to the person that outweighs any risk or burden. Alternatively, if it is to derive new scientific knowledge it must be of minimal risk to the person and be carried out with minimal intrusion or interference with their rights. Carers or nominated third parties must be consulted and agree that the person would want to join an approved research project. If the person shows any signs of resistance or indicates in any way that he or she does not wish to take part, the person must be withdrawn from the project immediately. Transitional regulations will cover research started before the Act where the person originally had capacity to consent, but later lost capacity before the end of the project. 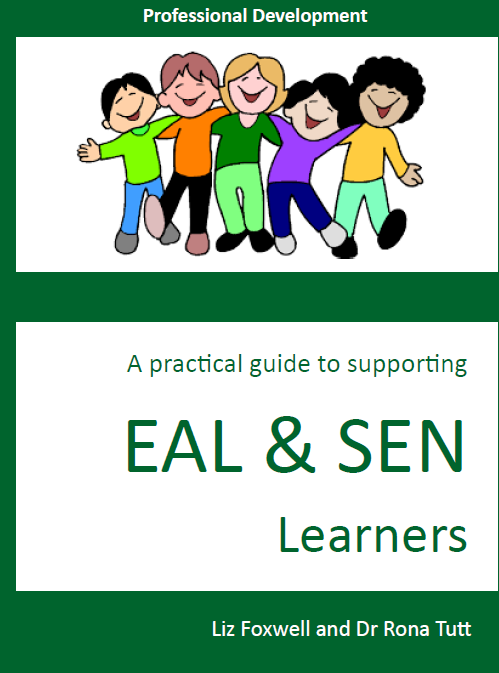 At last Rona and I have completed our handy practical guide to help and support you as teachers through the … are they just EAL or SEN or both? minefield. 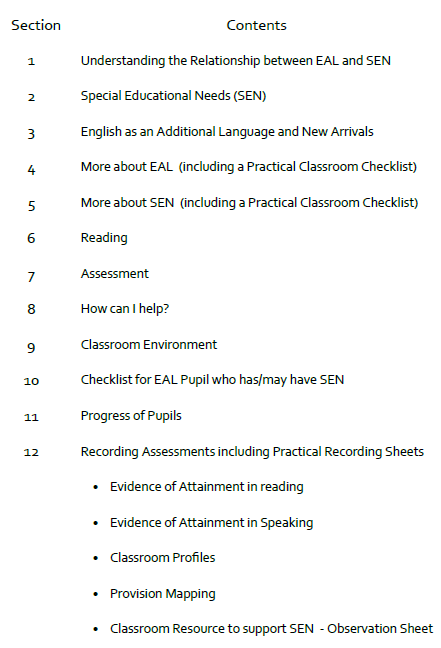 Bang up to date with the curriculum and SEN changes for the 2014/15 academic year which sees the age range higher and the introduction of a new acronym SEMH which we will all have to be familiar with not just the SENCO or EAL TA. Structured around current legislation it gives practical support to support you in your decision making as to whether they are naughty children just trying it on or have a need that is currently not supported. Great for new teachers or experienced alike. 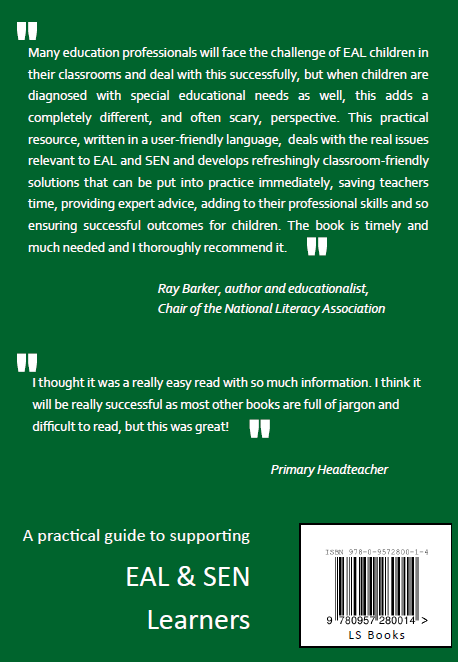 For a copy of the e book priced at £15.00 (not including p and p) contact lsbooksinfo@gmail.com. Printed copies available soon.